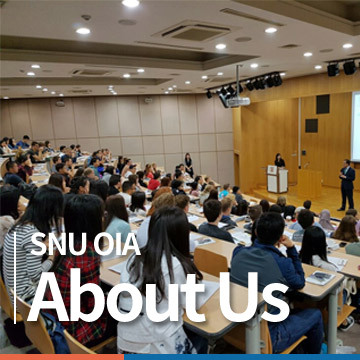 The Office of International Affairs, As SNU's headquarter for developing and promoting its international programs and initiatives, welcomes all students and scholars to SNU's vibrant intellectual community. International Summer Program, Since its establishment in 2007, more than two thousand students from around the world have participated in the SNU ISP program to learn, experience, and enjoy for an unforgettable summer of academics, activities, and long-lasting friendships. Launched by Office of International Affairs (OIA), Seoul National University (SNU), offers students a great opportunity to study abroad in major cities around the world. SWPs combine the excitement of study abroad with the academic rigor of classes taught by SNU faculty. November 15, 2018 30 International Students went to Duksu Palace, learned Jang gu, a Korean traditional instrument, and watched a Korean dance play.